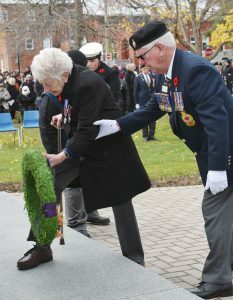 Some changes are being planned regarding the annual November 11th Remembrance Day Parade and Ceremony in Carleton Place. The organizing committee, spearheaded by members of the local Legion Branch #192 in Carleton Place met recently to discuss this year’s event, and since this year will mark the 100th Anniversary of Armistice, have included a few changes to mark this monumental occasion. On November 11, 1918, at 11:00 a.m. – The eleventh hour, of the eleventh day, of the eleventh month, “the war to end all wars” came to an end. The guns finally fell silent, bringing to a close four long years of unspeakable war. Close to 61,000 Canadians were killed during this Great War and another 172,000 were wounded. Those who paid the supreme sacrifice included 47 of our own from here in Carleton Place. This year, The Royal Canadian Legion will assist in commemorating this historical 100th centenary, through the introduction of a Bells of Peace Initiative to honour through Remembrance, the Armistice of 1918. The general concept derives from the use of bells as a celebratory announcement that the war had ended. This was common at the end of both WW1 and WW11. The Legion’s intent is to have every bell in every community across Canada ring in unison or independently (within each community) 100 times at sunset on November 11th, 2018 to signify the 100th anniversary of the WW1 Armistice. An informal gathering will take place at the local Cenotaph at 4:45 p.m. of any and all residents related to anyone from Carleton Place who served during WW1. They, as well as all residents of Carleton Place, are invited to this informal gathering and are asked to bring any type of handbell with them to ring as well at this special ceremony. Members of our local Royal Canadian Sea Cadets #211 Lanark and Navy League Cadet Corps #181 Carlplace will also participate at this informal gathering by ringing their ships bell 100 times during the gathering at the Cenotaph. Plans are also in the works for the ceremony this year to include a flypast at 11 a.m. of a bi-plane. It is to not only commemorate the 100th anniversary of Armistice but also being planned as a tribute to local hero Arthur Roy Brown, who is credited with shooting down the infamous “Red Baron”, Manfred Freiherr von Richthofen, 100 years ago on April 21, 1918.